Ms. Catherine De Bolle is Commissioner-General of the Belgian federal police. Since 2012, she has been Head of Belgian delegation to Interpol, and since 2015, she represents Europe to the Executive Committee of Interpol. 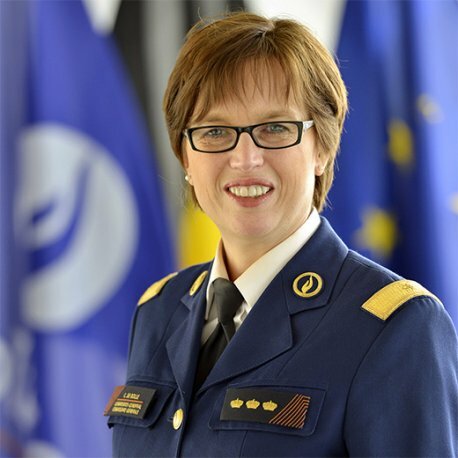 She is also Chair of the Belgian Coordination Committee for Intelligence and Security, Head of Belgian delegation to Standing Committee on operational cooperation on internal security of the European Union (COSI), and member and occasional lecturer in the International Association of Chiefs of Police (IACP). She has undertaken extensive programme of international engagement including the conclusion of Memorandums of Understanding for instance with FBI, UK, France, Australia, Andorra, Colombia, Moldova, Serbia, Romania, Turkey, Algeria. She served as chair of the BENELUX Strategic consultation platform. Ms. De Bolle holds her Master’s degree in Law from the Ghent University, and is a graduate of the Royal Gendarmerie Academy.